If you appreciate fine meat with a wonderful aroma, that looks great, melts in your mouth and is full of flavor, then you can appreciate all the effort Gary Bardine puts into his award winning meats. 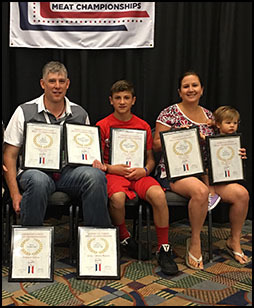 Gary Bardine has brought home more than 250 awards from both the Pennsylvania Association of Meat Processors (PAMP) and the American Association of Meat Processors (AAMP) competitions since 2002. Entries in these competitions are judged anonymously by meat scientists and other industry experts. They seek to find meat products that exhibit the highest caliber of quality, excellent craftsmanship, superior flavor, and eye appeal possible. In July 2007, Gary Bardine brought home four more plaques from the American Cured Meat Championships. 746 products were entered into 26 classes at the AAMP-sponsored competition. Gary topped 37 other entries to win the Grand Champion award for his lightweight bacon. He also took honors for his ring bologna and won Reserve Grand Champion for his lightweight bone-in ham and a Champion designation for a large diameter luncheon meat entry. In 2008, instead of entering the PAMP competition, Gary served as distinguished judge, actively supporting the meat industry and the members of PAMP and AAMP. Created & Maintained by Bardine's Country Smokehouse, Inc. & BNS Web Creations. Wordcrafters, Content Developer. © 2007 - 2014 Bardine's Country Smokehouse, Inc. All Rights Reserved.